Back in August, I was visiting my in-laws and we decided on some beautiful fabrics for me to use to make them an over-sized lap quilt. They both quickly agreed that they wanted fall colors, and my mother-in-law and I had a wonderful afternoon in a local quilt store looking at fabric. 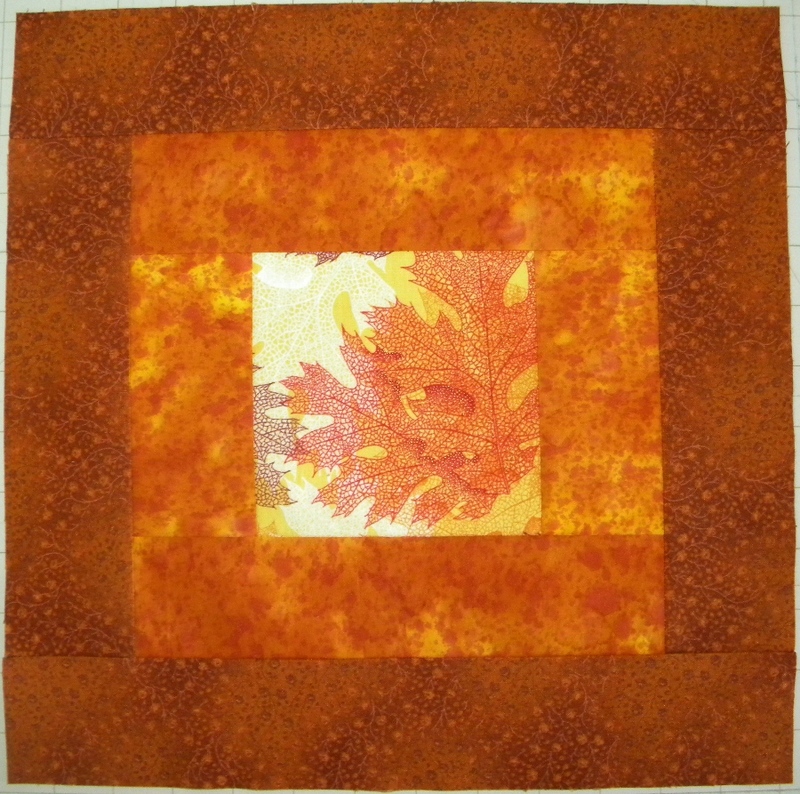 We picked out 8 different fabrics based around a green ginkgo leaf fabric and orange ginkgo leaf fabric (look at the border for the finished quilt; it also shows up repeatedly throughout the quilt). 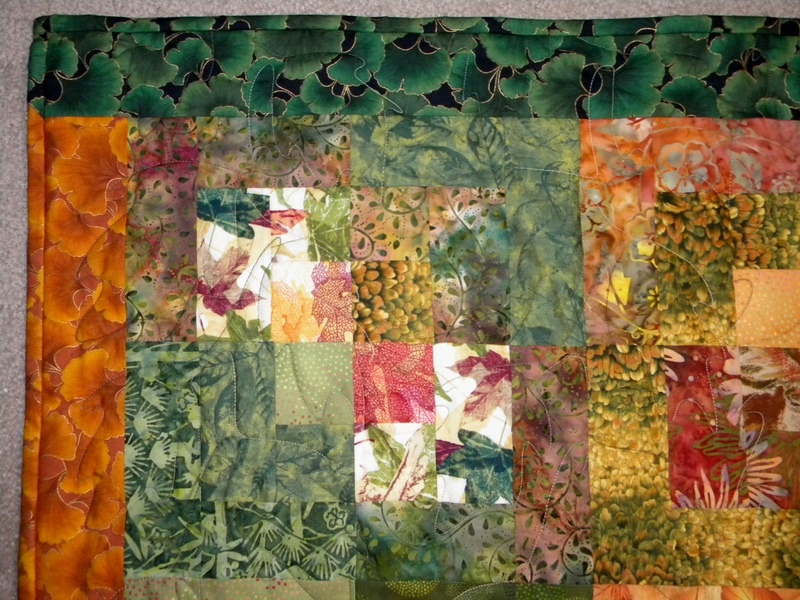 So the quilt was going to be green and orange and rely heavily on fabrics with leaf print. Sweet! I was thinking about making another log cabin, but for my birthday I got a lovely book called “Cozy Modern Quilts” and I thought that I would make them a “Four Square” quilt instead. And then I spent an entire day playing around with out to piece it all back together. Once I had the layout done, I finished piecing together the top very quickly. I then sent the quilt and backing off to my lovely mother in Tennessee who took it to her local quilt shop to have it quilted. It was either too expensive or going to take too long to get it done locally here in California. The backing is a continuous piece of batik fabric I ordered from fabric.com. 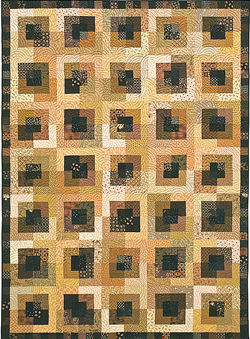 I was a bit apprehensive about whether or not it would match, but I think it is beautiful and just right for the quilt! 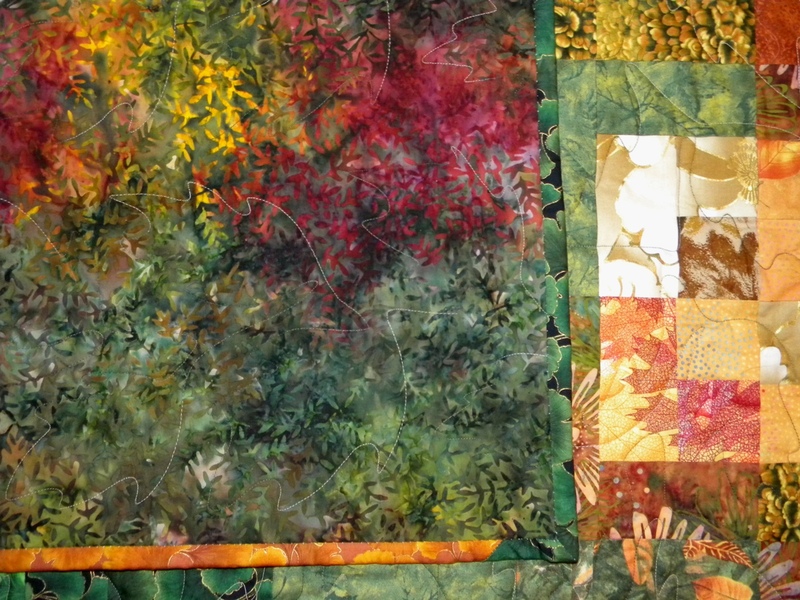 If you look at the larger picture below, you get a better detail of the quilting, which is a repeated oak leaf pattern in a variegated green thread. 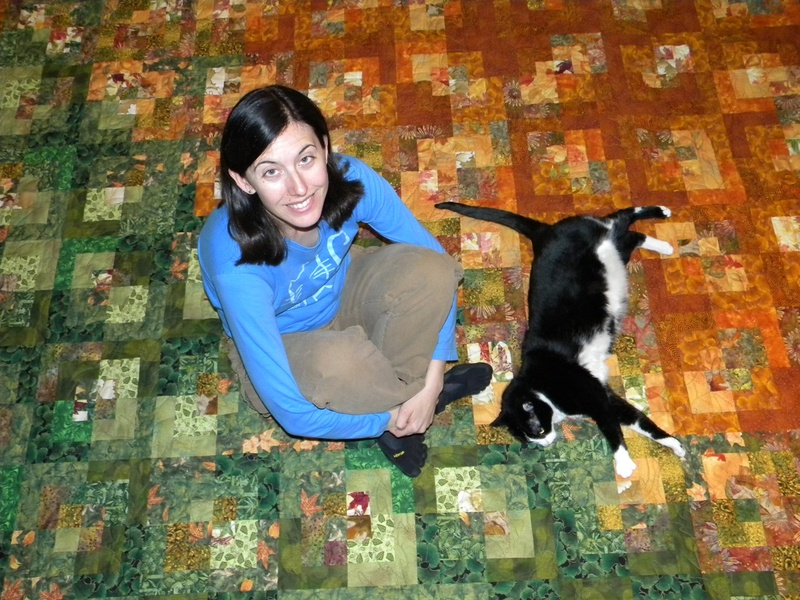 Just a few days after I finished the binding, I traveled out to visit and deliver the quilt in person. It looks so great on their bed!!! It’s so pretty! 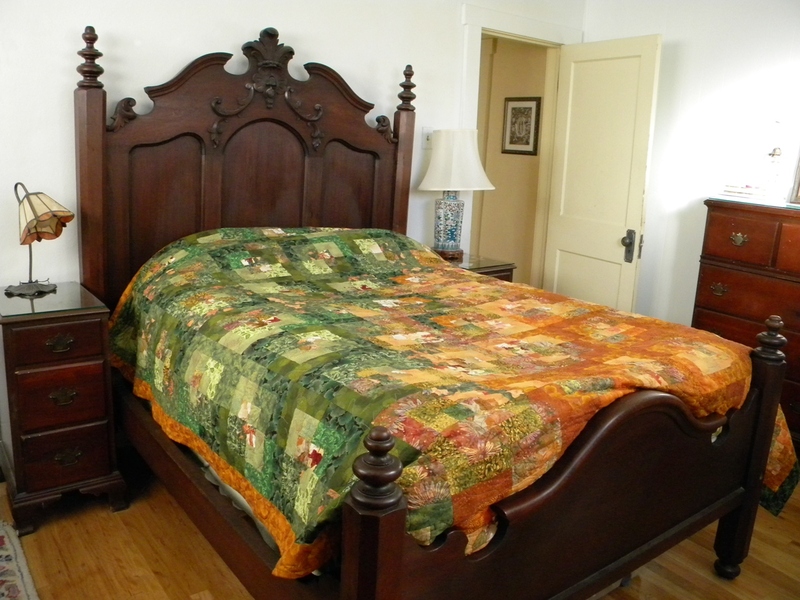 Although I might be partial since my first quilt, which is still on our bed, has such a similar color scheme and pattern. 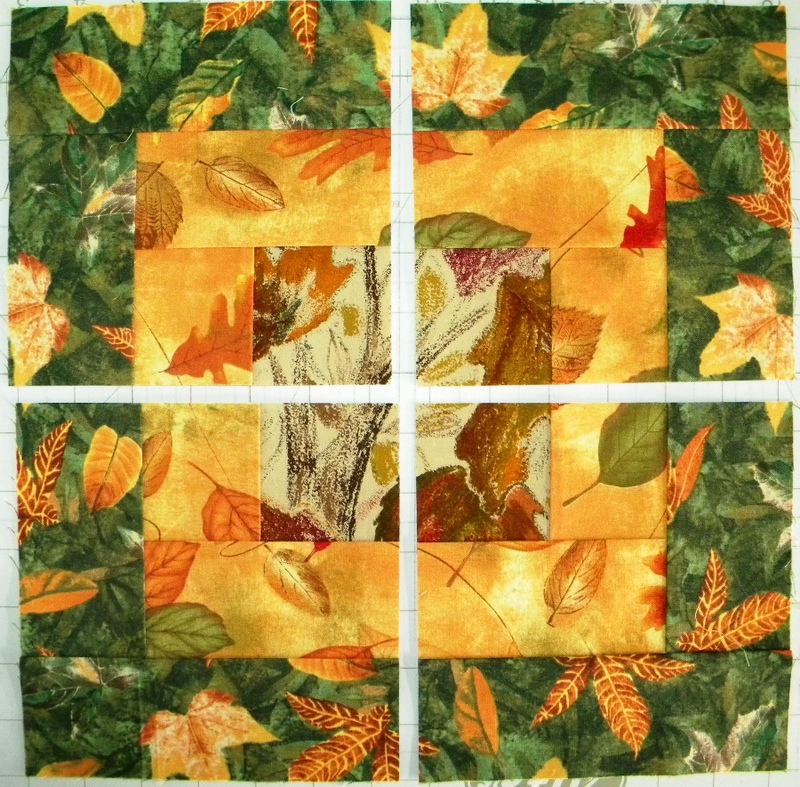 I love the leaf quilting, it is so subtle on the front, but adds a nice detail to the back! Nice to see these earlier quilts . 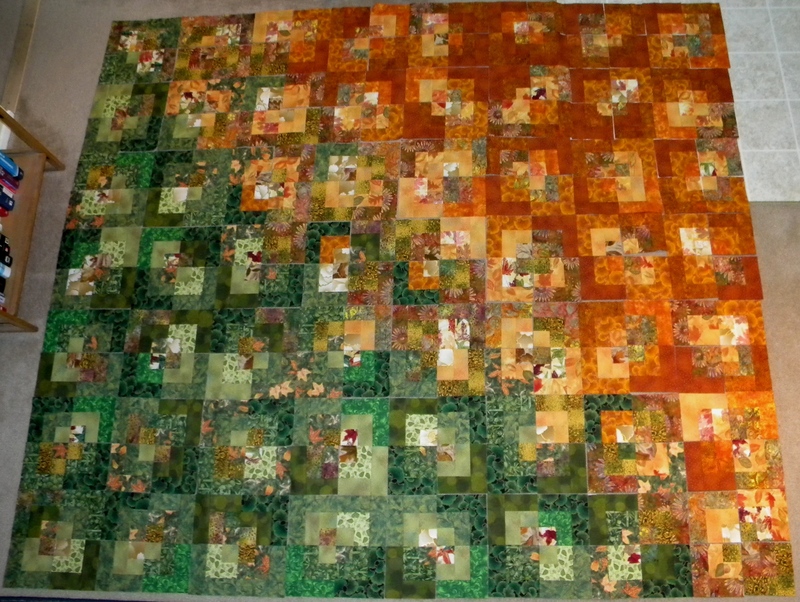 I have a fall quilt from around twenty years ago , still not quite finished .